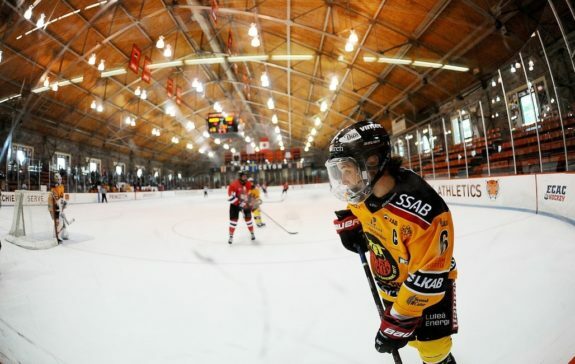 The venerable old Hobey Baker Memorial Rink housed what will be recalled as a storied affair, as the NWHL’s reigning champion Metropolitan Riveters faced the SDHL (Svenska damhockeyligan) champions, Luleå HF/MSSK. The game between the two teams was a dead-heat at times, as both squads played their hearts out. The prize being contended between the two of them was the first ever Champions Cup – a trophy signifying the best of the best in women’s hockey. By no means was this a game that could be characterized as exhibition or just for show. Rather, both sides viewed it as an “us against them” matchup – a waging of war on ice. For the spectators, there was a bit of everything -Olympians, a plethora of end-to-end skating and scoring chances, chippiness and feistyness, a natural ebb and flow between two powerful clubs, and a genuine hard fought game. Make no mistake – the outcome of this game meant something to the players on either side. 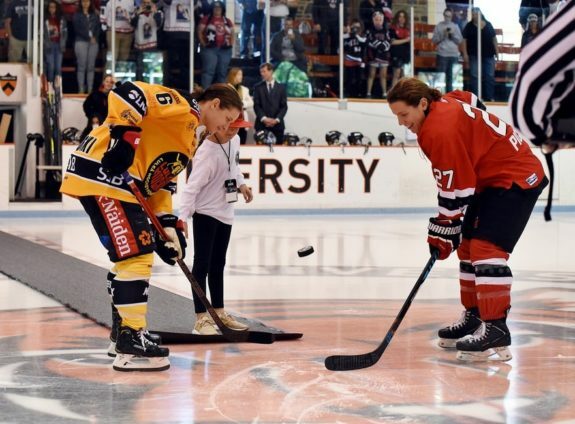 Luleå HF/MSSK’s captain Jenni Hiirikoski (#6) takes the ceremonial face-off against Metropolitan Riveters’ captain Michelle Picard (#27) at the first ever Champions Cup (Photo Credit Troy Parla). As it would turn out, it was Hiirikoski’s Luleå that would raise the Champions Cup on the hallowed ice – theirs to hold high. The outcome came after a 4-2 victory by the Swedish team, with the final tally being an empty-net goal by Luleå’s Emma Nordin in the dying moments of the game. Looking back on the first of its kind, THW offers five key takeaways from Luleå HF/MSSK’s tremendous win of the first Champions Cup and the valiant performance by the Metro Riveters as well. Though the first period of the game finished locked at 0-0, the ownership of that period belonged to Luleå. They possessed the bulk of the scoring chances in the opening frame and really had the Riveters hemmed in their own zone. Metro’s goalie Katie Fitzgerald was kept busy, while Luleå’s netminder Sara Grahn saw very little come her way. While the first period was controlled by Luleå, we will give the decision on the second period to the Riveters. It did not take long for tempers to flare. When two of the best women’s hockey teams in the world are pitted against one another, neither is going to want to give an inch. Players from both sides came at one another full throttle, and the second period was the most action packed. Luleå alone was on the receiving end of eight penalties in the period. Luleå HF/MSSK’s team captain Jenni Hiirikoski carries the puck out of the corner at Hobey Baker Memorial Rink (Photo Credit Troy Parla). 17:40: The Riveters’ Rebecca Russo played like a woman possessed all game long. After Luleå went up 1-0, she had a beautiful end-to-end rush with Metro on the power play. As she flew into Luleå’s zone from the left and swept in behind the net, Russo collided with two opposing defenders and nearly went head over heels. Russo was somewhat shaken up on the play, but managed to finish the game strong. 16:40: Close to a minute later the Rivs’ Kelsey Koelzer carried the puck into the zone, and was squeezed off the play by Hiirikoski in front of Luleå’s net. An errant stick from Koelzer as she followed through on her shot caught Hiirikoski alongside the head. Noticeably irritated, Luleå’s captain then gave Metro newcomer Kristin Lewicki a rough ride into the boards. Hiirikoski was assessed a roughing minor for her play on Lewicki and served her time in the box. 12:32: Madison Packer of the Riveters was a thorn in Luleå’s side all game long. Playing her normal aggressive style, she made contact with Grahn with 12:32 to go in the second, and ended up on the ice in a tangle of Luleå players who took exception. Both Packer and Luleå’s Linn Peterson would see time in the box because of this particular occurrence. Additionally, Packer and Hiirikoski were seen jawing at one another from time to time at various moments in the game. The physicality was a very positive aspect for both teams. Nothing got out of control – the officials dished out infractions when warranted, and kept the players from going off the rails. It was good, hard-nosed hockey from both sides. With two goals to her credit – including a shorthanded marker with two of her teammates in the box – Michelle Karvinen earned the MVP honors for the game. She was decisively the best player on the ice between either team, and proved to be a difference maker. Karvinen was relentless all game long and continuously attacked. Try as they might, the Riveters just could not encapsulate her in order to neutralize. 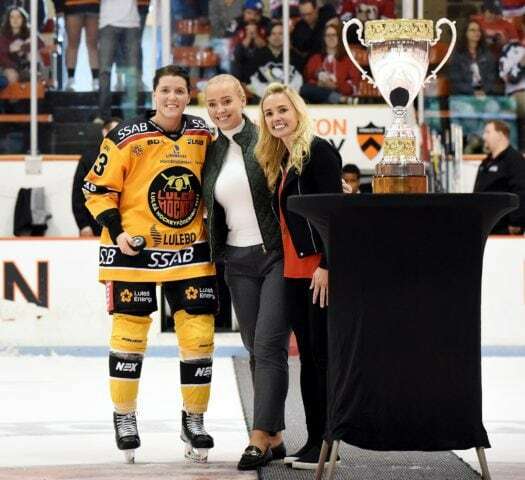 Luleå HF/MSSK’s Michelle Karvinen (left) was named Most Valuable Player of the inaugural Champions Cup (Photo Credit Troy Parla). Her first goal came just 27-seconds into the second period as she followed up on a deep puck which was fed out front to her by Nordin. Karvinen chipped a shot into the top corner over Riveters goalie Katie Fitzgerald to put Luleå 1-0. Even after the Rivs’ Kelly Nash tied it 1-1 with less than six minutes remaining in the second frame, it would be the Luleå sniper who would put her team ahead once more. With 13:45 remaining in the third period, Karvinen capitalized on a beautiful 2-on-1 break with her team killing a 5-on-3 power play. Of the six goals scored throughout the day, this one was indeed the finest and was representative of how strongly Karvinen played all day long. Capable of playing either wing, Karvinen has been the SDHL’s leading point scorer each year since the 2015-16 season, her first in the league. This past 2017-18 campaign she scored 30 goals and 38 assists in only 34 games for 68 total points. She is also a three-time Olympian for Finland, and twice has helped her country win bronze – most recently at the 2018 PyeongChang Winter Games. For those who know what Karvinen is all about, her taking home MVP honors is not a surprise. What is the Riveters’ gain has become the Buffalo Beauts’ loss. Speedy forward Kristin Lewicki – known affectionately throughout the league as “Wheels” — is entering her first season as a Metropolitan Riveter. Lewicki played her rookie year during the 2017-18 season as a member of the Beauts, and saw herself elected to play in the 2018 NWHL All-Star Game. Not being re-signed by Buffalo for the upcoming 2018-19 season, Lewicki signed with the Riveters and instantly helps bolster their chances of repeating as Isobel Cup champions. 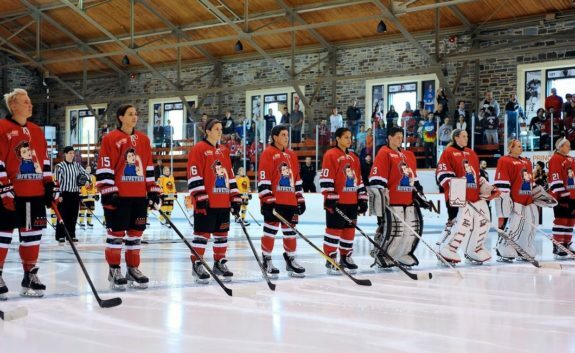 The Metropolitan Riveters are lined up for the national anthems of the USA and Sweden at the Champions Cup inside of Hobey Baker Memorial Rink(Photo Credit Troy Parla). A diminutive forward (Lewicki is listed as 5-foot-2 in her stats, but is likely closer to 5-foot), she is one of the fastest skaters in the NWHL – if not the fastest. If the Riveters had a hard time controlling Karvinen, Luleå had its own troubles with Lewicki. Enough so that after Karvinen made the score 2-1, “Wheels” used her speed to break into Luleå’s zone. Brilliantly using the opposing defender as a screen, Lewicki sent a soft shot to the Luleå net which eluded Grahn and tied the score at 2-2. The tally by the Rivs newcomer gave them some renewed life and kept them in the game. During Lewicki’s rookie season with Buffalo she tallied five goals and two assists for seven points in 14 regular season games. Look for her point totals to go up even more this season. Luleå was certainly the better team on this particular day. However, it would be remiss to ignore the fact that the Riveters played the game with a depleted roster. While all three Metro goalies were dressed for the game, only 12 skaters were in the lineup for the Riveters – eight forwards and four defenders. Top end players like 2017-18 NWHL MVP Alexa Gruschow, Riveters captain Michelle Picard, Russo, and Packer had to see double-duty all game long. Though a roster shortage is not an excuse for the loss, it was certainly a factor as the game went along. The Riveters did not let off the gas pedal, but there is only so much energy that a team can muster without a full supporting cast. Players like Karvinen and Hiirikoski are two of the finest hockey players in the world today. Teams skating with full rosters are worn down by those two players in the Olympics, let alone in Sweden or against an NWHL club. 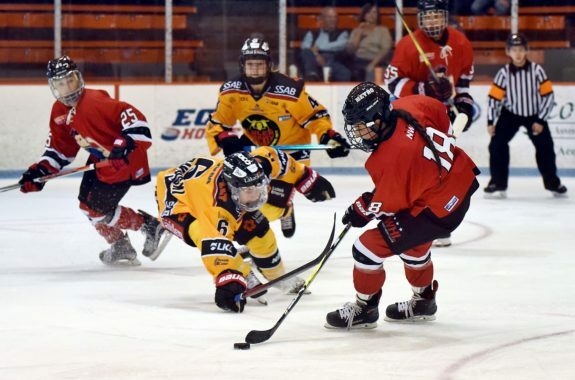 The Metropolitan Riveters’ Rebecca Russo (#18) tries to carry the puck around Luleå HF/MSSK’s captain Jenni Hiirikoski (#6), as Metro’s Kristin Lewicki (#25) tries to help in the background (Photo Credit Troy Parla). Kudos to the Riveters for their never-say-die attitude. Going up against Luleå is a difficult row to hoe for any team, and they did so with less than their best. The game could have gone either way once it was knotted at 2-2. At that point, something had to give and one team would need to get a bounce to go their way. As Luleå’s Noora Tulus redirected the puck from linemate Rebecca Stenberg, Fitzgerald made the initial stop but the puck ended up caroming off of Metro’s Lexi Slattery’s skates and into her own net. This made the score 3-2 with 7:51 left in the game. A very unfortunate bounce for both Slattery and the Rivs, as the goal ended up being the game-winning goal. With such a successful first Champions Cup, the potential is there – if not the likelihood – to include other women’s leagues into future tournaments. In addition to the NWHL and SDHL, there could easily be future inclusion of the Canadian Women’s Hockey League (CWHL), Russian Women’s Hockey League (WHL) (NOTE: WHL is anglicized from Женская хоккейная лига (ЖХЛ)), and/or Finland’s Naisten Liiga to name a few. The fact that the Champions Cup trophy includes engravings in those respective languages (and others) seems indicative of what lies ahead. Luleå HF/MSSK were the recipients of the first ever Champions Cup. 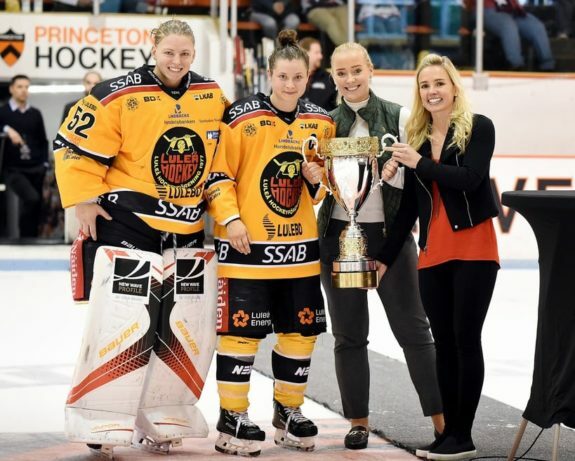 NWHL Commissioner Dani Rylan (far-right) presents the trophy to Luleå captain Jenni Hiirikoski. (Photo Credit Troy Parla). Given time, an annual Champions Cup tournament spearheaded by the NWHL could become a marquee event for women’s hockey. An opportunity to pit the best against the best from across from the globe. A note of thanks to both NWHL Commissioner Dani Rylan, the SDHL, Luleå HF/MSSK, and the Metropolitan Riveters needs to be mentioned for making this first competition a tremendous success.